MCDM AG.COM | M A RCH /A PR IL 2018 | Medical Construction & Design 29 throughout all treated areas, providing greater speech pri- vacy than the typically erratic spectrum produced by HVAC, even at the same volume. Value-engineering the results At 30 dBA, the masking sound is barely audible and yet pro- vides the minimum necessary to accurately plan the remain- ing design elements. However, there are signifi cant opportuni- ties for further value engineer- ing because the predictable overall volume and spectrum allows one to reduce the specifi cations for the room's physical shell. If speech privacy equals STCc + 30dBA ≥ 75, then, for every 1 dBA increase in the background sound level, it is possible to reduce STCc by one point and achieve the equiva- lent level of speech privacy. Were the background sound to be increased from 30 dBA to 35 dBA, for instance, construction costs for partition types would start to drop signifi cantly because the STCc could be re- duced by fi ve points. 35 dBA is still well below typical masking levels in closed rooms. Usually, they are set between 40 and 43 dBA in such spaces. There are signifi cant opportunities for value engineering whereby acoustic performance can be improved, while reducing construction costs. Note that, with the exception of the corridor walls and toilet room, increasing the minimum background sound level to 40 dBA aff ords the opportunity to lower STCc by 5-10 points and, in all cases, maintains or enhances the SPP of the integrated assembly as compared to the existing guideline. While it is impractical to reduce the STCc of the corridor walls, the simple increase of the background sound level signifi cantly improves the SPP of this adjacency. With a suitable design of sound masking, walls and ceilings, it is also possible to achieve privacy with walls built to the suspended ceiling rather than to the structure. In one example, a healthcare provider changed its construction stan- dards for medical offi ce build- ings away from deck-to-deck construction. After signifi cant testing of mock-up facilities, the company determined they achieved as good or better speech privacy with ceiling- height walls and sound mask- ing. They reported cost savings of hundreds of thousands of dollars for a project of just over 30,000 square feet. Future fl exibility In order to maintain the SPP of various adjacencies, the con- tinuous minimum background sound level cannot be set below the defi ned minimum. However, there are conditions under which it may be advanta- geous to increase it. In patient rooms, sleep disruption is one of the greatest design challenges. A signifi cant number of arous- als and awakenings occur as a result of noises originating both inside and outside the room. While the minimum background sound level must be maintained to ensure speech privacy between adjacencies, it is technically possible to em- power the patient to raise their room's masking above this level in order to cover or lessen the disruptive impact of noises. Indeed, due to its ability to reduce the quantity and sever- ity of volume changes (e.g., dynamic range), sound mask- ing has been shown to be an eff ective method of improving sleeping conditions. 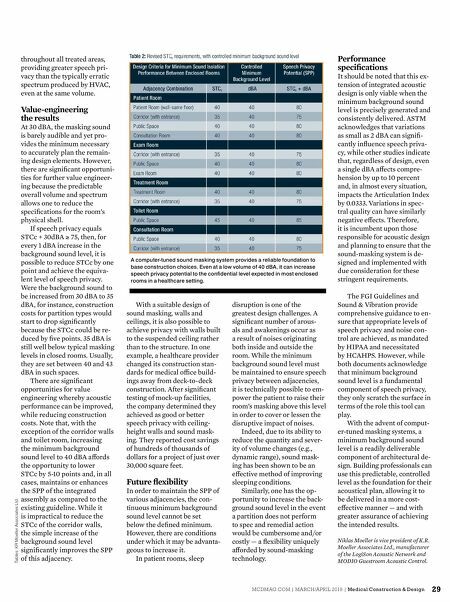 Similarly, one has the op- portunity to increase the back- ground sound level in the event a partition does not perform to spec and remedial action would be cumbersome and/or costly — a fl exibility uniquely aff orded by sound-masking technology. 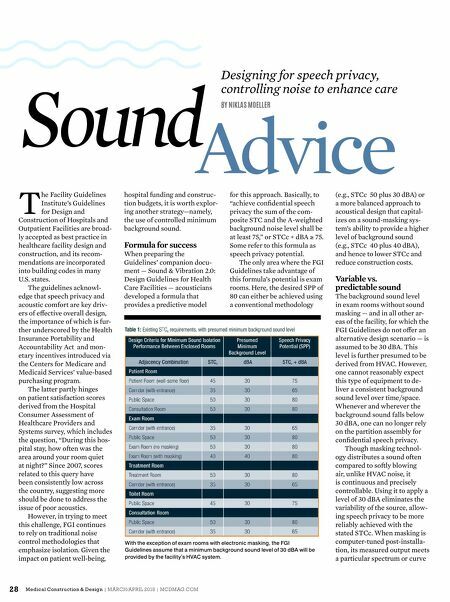 Performance specifi cations It should be noted that this ex- tension of integrated acoustic design is only viable when the minimum background sound level is precisely generated and consistently delivered. ASTM acknowledges that variations as small as 2 dBA can signifi - cantly infl uence speech priva- cy, while other studies indicate that, regardless of design, even a single dBA aff ects compre- hension by up to 10 percent and, in almost every situation, impacts the Articulation Index by 0.0333. Variations in spec- tral quality can have similarly negative eff ects. Therefore, it is incumbent upon those responsible for acoustic design and planning to ensure that the sound-masking system is de- signed and implemented with due consideration for these stringent requirements. The FGI Guidelines and Sound & Vibration provide comprehensive guidance to en- sure that appropriate levels of speech privacy and noise con- trol are achieved, as mandated by HIPAA and necessitated by HCAHPS. However, while both documents acknowledge that minimum background sound level is a fundamental component of speech privacy, they only scratch the surface in terms of the role this tool can play. With the advent of comput- er-tuned masking systems, a minimum background sound level is a readily deliverable component of architectural de- sign. Building professionals can use this predictable, controlled level as the foundation for their acoustical plan, allowing it to be delivered in a more cost- eff ective manner — and with greater assurance of achieving the intended results. Niklas Moeller is vice president of K.R. Moeller Associates Ltd., manufacturer of the LogiSon Acoustic Network and MODIO Guestroom Acoustic Control. A computer-tuned sound masking system provides a reliable foundation to base construction choices. Even at a low volume of 40 dBA, it can increase speech privacy potential to the confi dential level expected in most enclosed rooms in a healthcare setting. Tables: KR Moeller Associates Ltd.